Jason Aldean is taking his tour to stadiums. He has sold 27,000 tickets for his first headlining stadium show, set for Aug. 5 at Crew Stadium in Columbus, Ohio. The 2012 My Kinda Party Tour will be the largest concert in Crew Stadium history and the first time a show there has sold out more than two months in advance. Lady Antebellum had the biggest selling night of its tour last week, when more than 18,600 fans turned out to see the group with Darius Rucker and Thompson Square in Cleveland. The Own The Night 2012 World Tour, sponsored by GAC, played to a combined total of 62,000 fans at shows in Cincinnati, Cleveland, Pittsburgh, and Rochester last weekend. Lady Antebellum also announced recently that the final leg of its Own The Night 2012 World Tour will visit Australia this September. Lady A won Group Video of the Year at last night’s (6/6) CMT Music Awards. 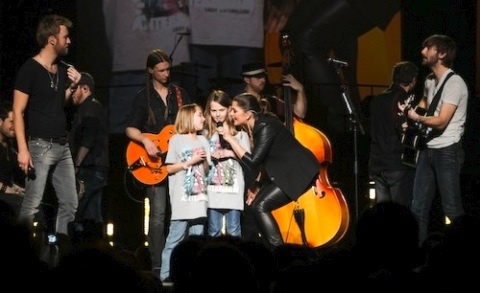 Lady A on stage at a recent tour stop.